We’re in a poopy mess here these holidays. Here’s a curious Catalan Christmas tradition that has to do with the act of defecation (other than the caga tió). And that’s the caganer, the “crapper”, or bluntly, the “shitter”. It’s a ceramic statuette of a person or fictional character squatting over a pile of poop. And it’s meant to be placed in a Nativity scene. After first learning of the caganer, I was puzzled. How can such an unpleasant, maybe distasteful act, be depicted in a holy, solemn Nativity landscape? An angel watches over the Child Jesus, the Magi present their blessed gifts, the animals peer over in reverence. And there he is — a man crouching down and relieving himself. Taking a dump. Laying a turd. Dropping the kids off at the pool. Its satirical presence is deeply woven into the Catalan Christmas culture. 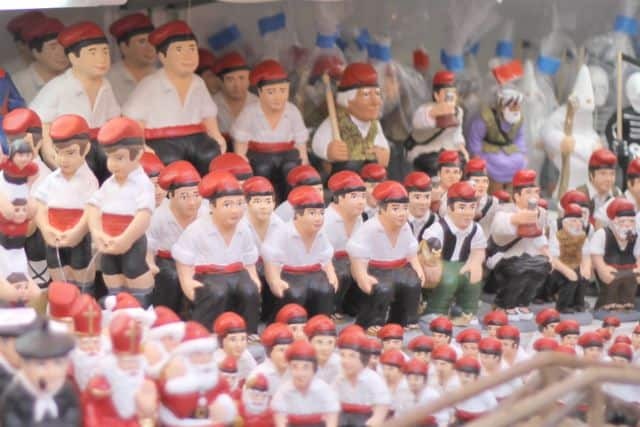 The traditional representation of a caganer is a peasant wearing a barretina (a red Catalan hat). As a sign of respect, he’s usually placed far away from the beloved Child Jesus in the manger. Throughout the generations, other popular culture variations of the pooper began to take form. 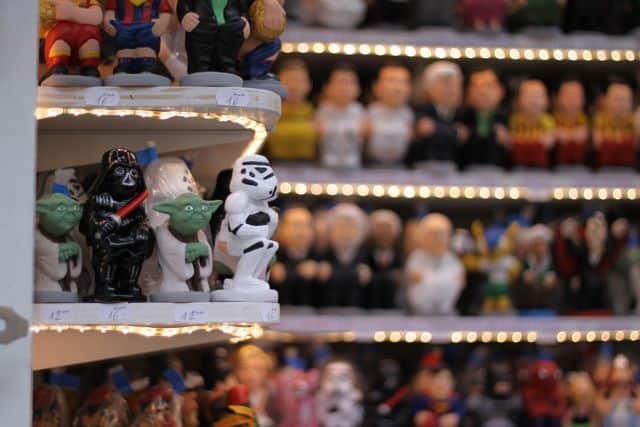 Currently, it seems that one ceramics company has dominated the caganer market, and that’s Caganer.com. Their stands are all over the Christmas fairs in Barcelona. In fact, they come out with novelties every year. 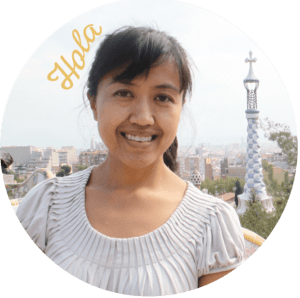 They often manufacture new soccer/football players on the FC Barcelona team, rising celebrities, and even the controversial La Moreneta, the Virgin Mary statue of Catalonia. 2017 – the urna (the voting ballots during the contested October Catalan referendum). Santa’s got a big duty. And a doodie. Done number two, Yoda has. And his other Star Wars counterparts too. A multi-tasker. A Catalan independentista holds its cherished flag proudly while bearing down. 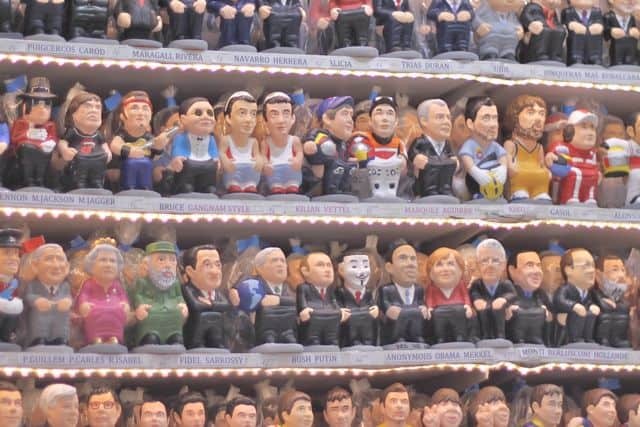 Caganer collectors can add a few characters from popular films and local television as well. Can you identify the first two? 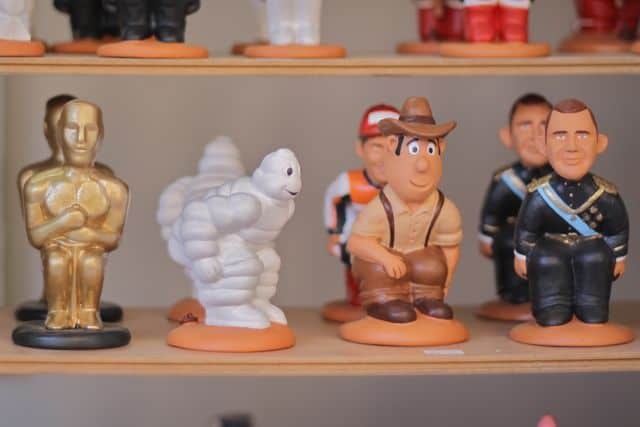 The Oscar statue, the Michelin man, Tedeo Jones (a Spanish character), and Prince Felipe of Asturias, Spain. 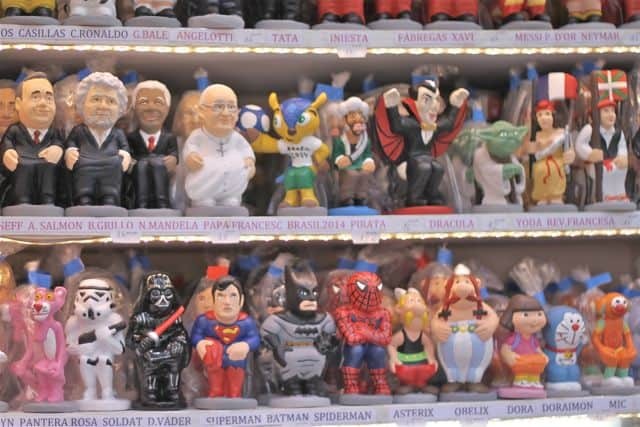 …Michael Jackson, Mick Jagger, Sy, Pau Gasol, Queen Elizabeth, President Obama…and more! I think they have everyone covered. Even your mama. What about our beloved President Trump? Have you seen the caganers up close? Do you own one?